My grandma, Edna Mae, loved needlecrafts and taught me how to crochet and needlepoint. She had a big rubbermaid bin under her bed full of plastic canvas, yarn and floss, etc. Whenever I was visiting and feeling a little bored I would pull that bin out and stitch or crochet. It was so much fun and I believe fueled my love for needlework. When my grandma passed away in 1992 my dad inherited her large needlepoint picture. He then gave it to me. He knew I would appreciate it, and I do. It's very big, so it was hard to get a decent picture of it. My grandma attached this paper about her needlepoint on the back. It came off, but I saved it. 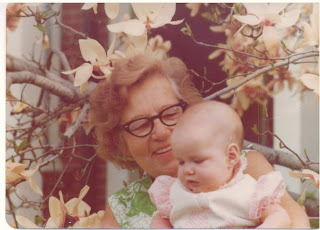 Here is a picture of my grandma and I on Mother's Day in 1975. Maybe she was working on her needlepoint during this time? It's so big I'm sure it took her quite awhile to finish! Nicole, that is so cool about your grandmother. It's so precious to have her needlepoint piece and to have such lovely memories of her too. That is a beautiful piece she stitched! That is so totally wonderful Nicole! What a treasure! What a precious gift to have in your house to treasure and remember your grandma by. How beautiful! What a great memory to have of your grandma. Nicole, that is a treasure for sure. I think it's wonderful that you have memories like that Rubbermaid box. I hope to inspire Olivia and Quinn to take up a needle one day. The pic of you two together really made your post extra sweet. That is so neat about your grandmother! 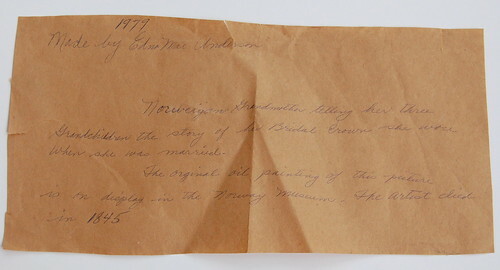 I love the picture of the two of you, and I also like the fact that she had a note attached to the back of the piece. Something that we all should do. I know that you'll treasure that piece forever. What a wonderful story, Nicole! And beautiful handwork that you will treasure. The picture of the two of you is very sweet. What a neat treasure to have. Not only that, you have the note from your Grandmother too! That is just too cool for words. Thanks for sharing that story Nicole! Wow, what a beautiful family keepsake to treasure, thank you for sharing. This is a great memory, Nicole. What a wonderful connection that stitched piece gives you to your grandmother! You obviously shared a love for needlework with her, and that makes it even more special. Thanks for sharing this story. Nicole... lucky you to have such a treasure from your grandmother. Love the snap of you and your grandmother. What an amazing legacy to have! It's beautiful! You are so lucky to have such wonderful memories of your Grandmother. How neat that your Father gifted this family heirloom to you. You must have been very special to your Grandma. Thanks for sharing your treasured needlepoint with us. What a treasure to have from your Grandma and I love the way she'd written about it and placed it with her finished piece. 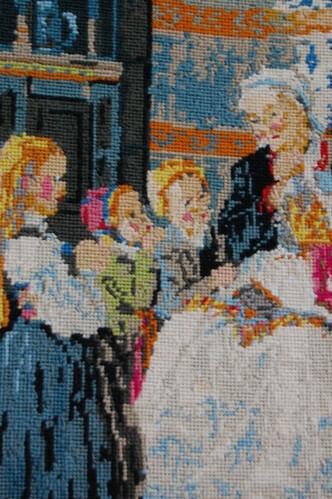 This is why we do our needlework, to hand down to other generations, and have them appreciate our work as much as we did at the time of stitching. Thanks for showing and sharing this wonderful story, Nicole. Nicole, what a wonderful memory. I love the picture of you and your grandmother. I can totally tell that's you! That is such an awesome story. What a treasure to have this needlepoint from your grandmother! What a wonderful piece to have! What a great heirloom to have & a wonderfu way to remember your Grandma. Очень трогательно! Бесспорно, прекрасная память! Oh, Nicole! 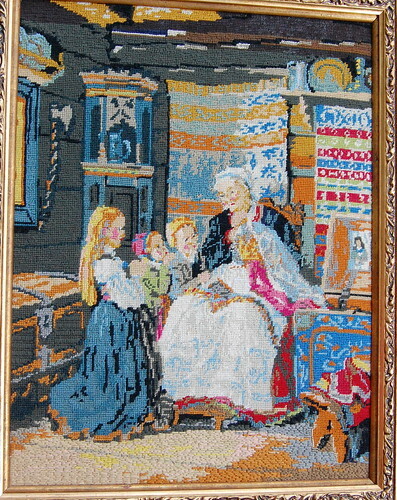 What a treasure and a BEAUTIFUL piece of needlework from your grandmother. I love it that she included information on the back, in spite of you finding out diffferent information. Maybe you should add your own handwritten note on it, as well, for when you some day pass it down. Just lovely. Lovely, Nicole. What a treasure. What a treasure, Nicole! That is so neat, both the stitched piece and the handwritten info on the back. It's gorgeous! And how nice that you have it and can appreciate all the work your grandmother put in to it. Your needlepoint is a treasure. I have one that was my Mum's...she passed away in 2003. She was a heavy smoker and I have not yet had the piece cleaned so I can enjoy it in my own home. Your post has inspired me to do just that. thank you! What a beautiful treasure! (and sweet memories to accompany it). Nicole! What a family treasure and that your grandmother took the time to write about it makes it even more special. Points to your dad for "getting it" and knowing that you would treasure it.